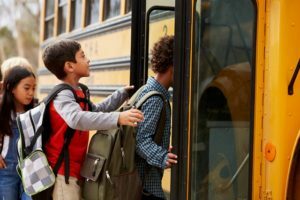 Back-to-School means an increase in drivers in school zones dropping off and picking up students, and school buses not only pulling in and out of school parking lots but also stopping several times around our neighborhoods. And it’s not just drivers ferrying our younger students, it’s college towns filling back up with young drivers and an increase in pedestrians walking to and from class. Always watch school buses for their flashing lights and blinking stop signs. Never drive past a bus with its safety lights on, even if you don’t see a child in the vicinity – there may be one at any second. It is illegal to pass a school bus from behind when it has its flashing yellow lights on. You must stop when the bus’ blinking stop sign is extended. Heed warnings for school zones, and be alert for students suddenly walking into the roadway. Commute time for workers is often also commute time for students – stay alert, don’t drive distracted, and slow down. If you are walking to work or school, also stay alert to your surroundings: Do not wear headphones that cancel out traffic noise, do not dribble or kick a ball while walking, and do not walk and text/email. Do use crosswalks and obey traffic signals indicating when it is safe to cross the street. Plan ahead: Give yourself extra time, especially when adjusting back to school-year schedules, which are often earlier than summer routines. Rushing only adds stress, which increases your level of distraction.